The twins stare sharply at the door in front of them, each waging a silent war within themselves as to whether or not open it. Rina: It would be rude not to say hello, you know. They continue to look at the entryway to the Director's office and time passes slowly for them. Rina: He can't be that bad, right? Rexel: That's what we thought about our step-mom and look at where that got us. Silence engulfs them once more and still neither can bring themselves to knock, even less open it. Rexel sighs deeply as she steels herself for the course of action she has decided to take. She gently lifts her hand to grasp onto the door's handle and Rina takes in a deep breath as she watches her sister raise her other hand and knocks ever-so gently that it almost doesn't make a sound. Nigel was sitting in his office doing paper work while listening the light patter of the rain on the window behind his desk. He glanced up at his computer, which sat to the right side of his desk, and saw that he didn't have any new messages. Good. he thought, Last thing I need right now is to have to deal with more paper work. He leaned back in his large leather chair that sat on wheels and swiveled around to gaze out the window as the water made strange patterns in the twilight. Nigel turned back to face his office and hazed at the numerous books that lined either wall leading to the door of the small room. His gaze stayed a little longer on the left bookcase as it also housed the secret door into the secret passage. As he gazed at the secret door he heard a small click come from the not secret door as it was strained with the weight from someone's hand. He then heard what may have been a knock but could also have been dismissed as a creak in the wood. Nigel thought, What's the harm in saying something? If someone's there then they'll come in. If not, only I would know that I spoke to no one. Nigel considered this before saying, "Come in!" The girls listened as a warm voice called for them to enter. They passed a nervous glance at one another before nodding in unison. As the girls entered they were met by the sight of an ordinary office and behind the large desk sat a young man. "Um..." Rexel started out shyly as she stood up straight before addressing the man in the plush leather chair. "I'm Rexel Knightly and this is my sister, Rina," She said while lightly motioning to the other girl beside her, "We're the new transfer students." Rina almost felt how badly Rexel was feeling under the man's attention. Rexel really had no speaking skills. "We thought we'd come and introduce ourselves to the director." Rina quipped in, hoping to save her sister from some embarassment. Nigel gazed upon the young girls that had entered his office. They were rather attractive though, Nigel knew what was 'off-limits' and what would be considered acceptable by society. Nigel listened to what the nervous girl said and the amendment made by the more confident sister. "Ah yes. Welcome to my school." he said with a warm smile. "I would offer you tea but, as you can see, I don't have the means to make tea. I'm working on that though. But come! Sit." he gestured to two chairs that were less ordained than his own and did not swivel or roll. They were simple in design but had cushions on the seat so as not to be completely uncomfortable. "My name is Nigel Uno. I'm commonly referred to as The Director though." Nigel was rather excited to have guests as it gave him an excuse not to do paper work. Both girls smiled warmly at the man's kindness and followed through on his offer to take the seats. The sudden thought of how silly their behavior was finally came to mind and a deep blush of embarrassment covered their faces. Rina was the first to speak. Rexel almost fell out of her chair at her sister's words but stopped just short of falling over. "Uh, I think she meant to say is 'You don't look bad'." The words suddenly sank in. "OH MY GOD!! WAIT THAT DIDN'T COME OUT RIGHT!" Rexel shouted as she stood up from her seat. Her blush now red-hot and bleeding down into her neck, "Ugh... Oh crap..."
Her hands went up to hide her face in shame as Rina bowed her's as well. This was not going the way they had intended for it to go. Rina recovered first, "We're sorry Director, It's just been a hard move for us and we're still adjusting..."
"Yeah, we're kinda not all here yet..." Rexel finished. Nigel started laughing. "Don't worry about it." he said, still smiling. "Yes, I am a bit young but, you see. I built this school myself." he said speaking towards Rina. He then turned to Rexel who had nearly fallen out of her seat. "Thank you for the compliment. I like to think I don't look bad myself and if it weren't for the fact that I may be brought up on sexual harassment charges, I'd compliment your appearances as well." he chuckled a little to himself. "But, enough of that. Tell me what you mean about this being a hard move." Nigel heard the words as he spoke them then quickly amended them, "You don't have to say if you don't wish to." The twins exchanged glances again and deep inside knew that the faster they got this over with the better off they would be. Rexel took her seat again, the blush still playing brightly across her face as her sister cleared her throat before starting. "Uh, well you see Sir, Rexel and I have just moved here recently on our step-mother's request and neither of us have had much time to adjust to our new environment." She told him with a fake smile, hoping to hide the pain that pierced her chest when she talked about it. "She kicked us out." Rexel mumbled from her sullen form. 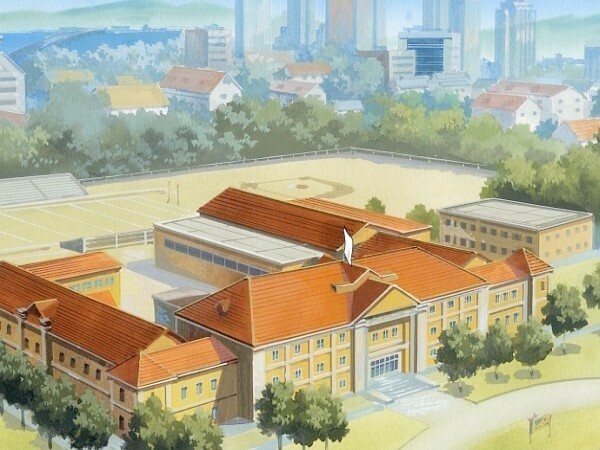 "Uh, well yeah kinda, anyway, like I said, we just moved here," Rina continued," And we don't know much about the area, or the school and we've kinda found ourselves in a rut of sorts. So please forgive us if we seem... out of sorts..."
Rina glanced over at her twin and saw that Rexel had begun to play with the watch their oldest brother had gotten her for her graduation from their last school. "We uh, just came by to say hello really and we just wanted to say thank you for accepting us despite our previous records." Rina ended finally, "We hope to have an enjoyable time in our stay here." Nigel politely listened to their story. He realized it must have been hard for them to tell him this. "There's nothing to forgive." he assured them. "My parents are both dead. They were murdered in fact. Along with my sister." he smiled at them. "I know it's hard to not have any family. I'm glad you found you way to my school. You're more than welcome to come and talk to me whenever you wish." He made sure to emphasize whenever. "I'm glad you applied to my school. I would have missed the chance to meet such well mannered young women. I hope you enjoy yourselves here as well." Nigel jumped as though he were startled when in truth, he remembered something. He rushed into his bottom drawer and pulled a small tin that he opened and revealed a few chocolate chip cookies. He presented them to the girls, "Please, have one. I baked them myself." The girls were startled upon hearing of his family's death and Rina smiled sadly as she gently grabbed a cookie that he had offered to them. Rexel just stared at him, sorrow clearly evident in her deep teal eyes. "I'm sorry for your loss." She replied as she turned her attention back to the watch that clung tightly to her wrist. Rina gently munched on the cookie, reveling in the sweet taste as she watched her sister continue to fidget with the watch. She then gently touched her pant's pocket, only to quickly be met with the hard shape of the locket that the same brother had given her. Pain shot through her at the thought of him and she almost wanted to cry. She missed him terribly. "Uh, well Uno-sensei, it was a real pleasure to meet you." Rexel commented as she got up out of her seat, her 'twin-sense', as she called it, telling her that if they didn't bolt out of there soon, they would have a breakdown. "Yes," Rina reiterated, "It's rather late and we were going to get up early tomorrow to train." "Thank you kindly for all your help and understanding..." She paused for a moment to finish the cookie, "and the cookie." Both girls smiled kindly towards the man in front of them and bowed deeply to him as they both said in unison "Good Night Uno-sensei." and turned to head back to their dorm room. Nigel noticed the deep sorrow in Rexel's eyes as she spoke. "There's no need to be sorry." he said, "You didn't do it." A flash of hatred that lasted but a second went unnoticed in his eyes. Noticing her lack of a cookie, he placed one in her hands. "They'll go to waste if no one eats them." Nigel wanted to know more about this training they would be doing but, they quickly expressed their desire to leave. "You're very welcome. Please, stop by again sometime. Perhaps I'll have some tea next time." he said, "Good night ladies." Nigel watched as they left the room and closed the door behind them. He wondered at their ethnicity though. He could have sworn they were English yet, their mannerisms suggested Asian. Nigel shrugged it off and sat back down to his paper work. He had a long night ahead of him.